Cast coppper alloy headstud brooch dating to c.75- 175 AD. The hook on the top of the head has broken. 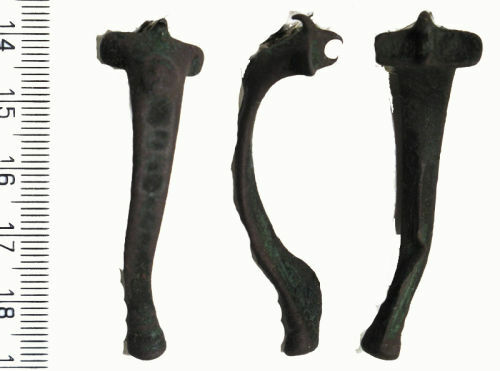 This hook would have held the spring in place behind the short square ended wings. The spring and pin are missing leaving just the chord on the reverse. The headstud is a small circular stud with a central circle in the centre. The bow has hollowed out squares all the way down to the foot which would have been filled with enamel but which are now empty. The foot consists of a double semi-circular moulding. The bow is bent close to the foot. The brooch is worn and is a brown patina with some green patches.